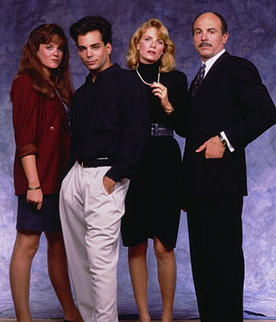 Performers include: Richard Grieco, Carmen Argenziano, Marcia Strassman, Lori Petty, and Katie Rich. Unable to find a job after exiting the Los Angeles Police Department, Dennis Booker (Richard Grieco) seeks the aid of his previous boss Captain Adam Fuller (Steven Williams) to find work. Fuller manages to help Booker get a position with the Teshima Group, a U.S. branch of a Japanese company that investigates questionable insurance forms. But getting any kind of help from the head of U.S. operations Dennis “Chick” Sterling (Carmen Argenziano) is quite the challenge as the two crossed paths in Booker’s old line of work. Booker’s leather jacket, jeans, and ever present 5 o’clock shadow contrast the suits, ties, and briefcases of the corporate world. He’s never been one to like being told what to do or what to wear and continually clashes with boss Alicia Rudd (Marcia Strassman). He ignores his very first assignment with the corporation to help his secretary Elaine (Katie Rich), who recently served jury duty and helped to convict a man she swears to be innocent. Later in the series, Suzanne Dunne (Lori Petty) joins Teshima Group as Booker’s secretary. She assists Booker as he investigate cases that, at times, have more to do with his co-workers, friends, and family than the needs of his employers. Booker learns that his father ran out on him as a child because he was made part of the witness protection program after testifying against a mobster. After all this time, he (Steve Inwood) come sout of hiding because he’s needed to testify in another mob case. First aired: May 6, 1990.